There is no such thing as a “correct” coding style, as there is no such thing as the best color. At the end of the day, coding style is a set of developers’ preferences. If you are coding alone, sticking to your coding style and being consistent is more than enough. The story is a bit different if you are working in a team: it is crucial to agree on a convention beforehand and make sure that everyone follows it. Even though there is no official style guide, R is mature and steady enough to have an “unofficial” convention. In this post, you will learn these “unofficial” rules, their deviations, and most common styles. File names should use .R extension. File names should be meaningful. File names should not contain / and spaces. Instead, a dash (-) or underscore (_) should be used. File names should use letters from Basic Latin, and NOT from Latin-1 Supplement. There should be no files that differ only by the letter case in the same folder and file names should be lowercase. There is nothing bad in having capital case names, just bear in mind case sensitivity and case preservation of your system. Case sensitivity means test.R and Test.R can coexist in the same folder. For instace, macOS file system (APFS) is not case sensitive by default. Use meaningful verbs for file names. If files should be run in a particular order, then use ascending names. AllClasses.R (or AllClass.R), a file that stores all S4 classes definitions. AllGenerics.R (or AllGeneric.R), a file that stores all S4 generic functions. zzz.R, a file that contains .onLoad() and friends. If the file contains only one function, name it by the function name. Use methods- prefix for S4 class methods. Generally, names should be as short as possible, still meaningful nouns. Variable names should be typically lowercase. NEVER separate words within the name by . (reserved for an S3 dispatch) or use CamelCase (reserved for S4 classes definitions). Instead, use an underscore (_). DO NOT use names of existing function and variables (especially, built-in ones). Generally, function names should be verbs. Use . ONLY for dispatching S3 generic. Add the underscore (_) prefix to a standard evaluation (SE) equivalent of a function (summarize vs summarize_ ). Class names should be nouns in CamelCase with initial capital case letter. The maximum length of lines is limited to 80 characters (thanks to IBM Punch Card). Put spaces around all infix binary operators (=, +, *, ==, &&, <-, %*%, etc.). Put spaces around “=” in function calls (except for Bioconductor). Do NOT place space for subsetting ($ and @), namespace manipulation (:: and :::), and for sequence generation (:). Put a space after a comma. 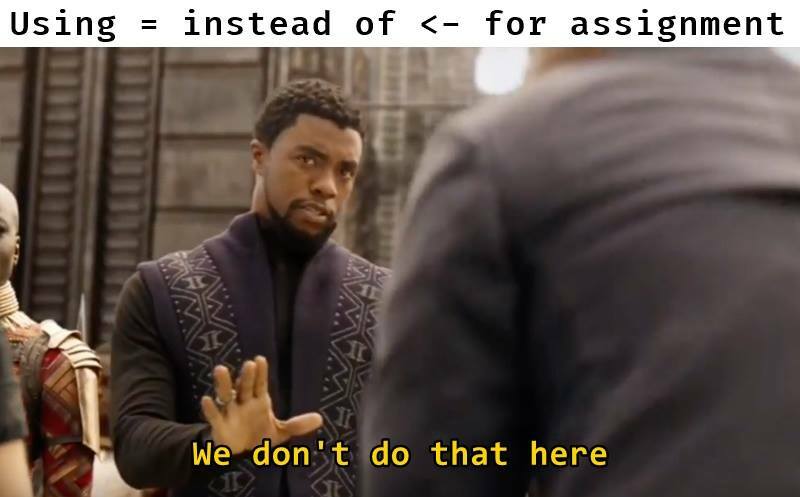 Use a space before left parentheses, except in a function call. No spacing around code in parenthesis or square brackets. An opening curly brace should NEVER go on its own line and should always be followed by a new line. A closing curly brace should always go on its own line, unless it’s followed by else. Always indent the code inside curly braces (see next section). Curly braces and new lines can be avoided, if a statement after if is very short. No tabs or mixes of tabs and spaces. There are two common number of spaces for indentation: two (Hadley and others) and four (Bioconductor). My own rule of thumb: I use four spaces indentation for data analyses scripts, and two spaces while developing packages. Choose the number of spaces of indentation upfront and stick to it. Never mix different number of spaces in one project. 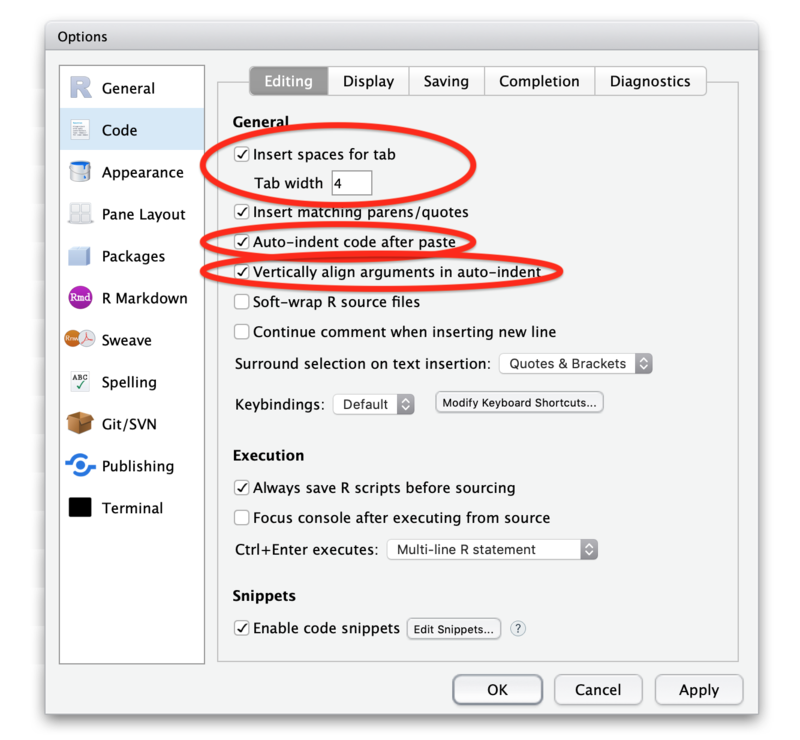 To set the number of spaces in the project, go to Tools -> Global options… -> Code -> Editing. 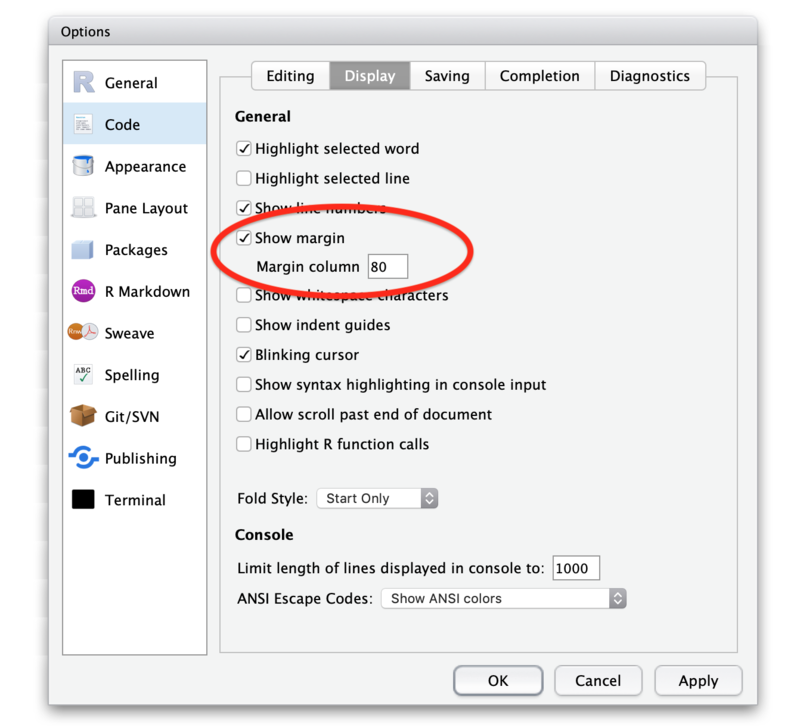 Check the following boxes: “Insert spaces for tab” (with “Tab width” equal to chosen number), “Auto-indent code after paste”, and “Vertically align arguments in auto-indent”. Magic shortcut: Command+I (Ctrl+I for Windows/Linux) will indent a selected chunk of code. Together with Command+A (select all) it is a very powerful tool, which saves time. Very often function definition does not fit into one line. In this case, excessive arguments should be moved to a new line, starting with the opening parenthesis. If arguments expand more than into two lines, then each argument should be placed on a separate line. The same applies to a function call: excessive arguments should be indented where the closing parenthesis is located, if only two lines are sufficient. Otherwise, each argument can go into a separate line, starting with a new line after the opening parenthesis. If the condition in if statement expands into several lines, than each condition should end with a logical operator, NOT start with it. I know some people who are completely against it. See the next item why I believe it is better. If the statement, which contains operators, expands into several lines, then each line should end with an operator and not begin with it. Sometimes, it makes sense to split a formula into meaningful chunks. Not only it is ugly, but also syntactically wrong. In the second case, R will consider these two lines as two distinct statements: the first line will assign the value of 1 / sqrt(2 * pi * d_sigma ^ 2) to normal_pdf, and the second line will throw an error, since * does not have the first argument. Each grammar statement of dplyr (after %>%) and ggplot2 (after +) should start with a new line. Comment your code. Always. Your collaborators and future-you will be very grateful. Comments start with # followed by space and text of the comment. Comments should explain the why, not the what. Comments should not replicate the code by a plain langue, but rather explain the overall intention of the command. Short comments can be placed on the same line of the code. To comment/uncomment selected chunk, use Command+Shift+C. Use roxygen2 comments for a package development (i.e., #') to comment functions. It makes sense to split the source into logical chunks by # followed by - or =. Use <- for assignment, NOT =. Use library() instead of require(), unless it is a conscious choice. Package names should be characters (avoid NSE - non-standard evaluation). In a function call, arguments can be specified by position, complete name, or partial name. Never specify by partial name and never mix by position and complete name. While developing a package, specify arguments by name. The required (with no default value) arguments should be first, followed by optional arguments. The ... argument should either be in the beginning or in the end. Always validate arguments in a function. While developing a package, specify the namespace of each used function, except if it is from base package. Do NOT put more than one statement (command) per line. Do NOT use semicolon as termination of the command. Avoid using setwd("/Users/irudnyts/path/that/only/I/have"). Almost surely your collaborators will have different paths, which makes the project not portable. Instead, use here::here() function from here() package. Avoid using rm(list = ls()). This statement deletes all objects from the global environment, and gives you an illusion of a fresh R start. If you have read until this moment, you deserve a treat. There is a magic key combination Command+Shift+A that reformats selected code: add spaces and indents it. Do not use it excessively though! Picture is taken from R Memes For Statistical Fiends Facebook page.